I've taken quite a few leadership classes, seminars, and have read my fair share of articles. Leadership is terrifying, especially if you — like me — choose to be the leader of small children. They look up to you and they respect you. But what's even more crucial (and friends who are teachers will willingly tell you) is that when they mess up, it's on you. A few years ago, our state decided to do away with a standardized test that was hurting our students in favor of a new one. But no one prepared the teachers for this new one, and they were told that it was up to them to prepare the students. If they failed, it was not on the kids — it was on them. "A Matter of Trust" focuses on the idea that you have to take responsibility for the actions that people take who are under your leadership. And sometimes that means taking responsibility for their bad actions. Leadership and trust are two central conceits that Arrow plays around with in this episode. And while this week's installment wasn't a bad one, necessarily, it was ultimately a little more underwhelming in most areas than the past two weeks have been. 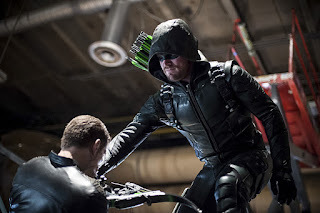 In terms of theme and writing (especially the flashbacks this week), "A Matter of Trust" felt more like filler and re-tread of a few of the central concepts the show returns to whenever it's in a bind and needs to focus on some moral lesson Oliver Queen will refuse to and then, ultimately, learn. (A few of those concepts, by the way are: identity, darkness/light, trust, and sacrifice). But while the theme might have been a little stale, the characters were the driving force, not the plot, and for that, the episode earns kudos from me. Because we got to see Oliver develop as a leader and come to a few key realizations thanks to Felicity; we got to see Diggle deal with his grief and guilt in a self-sabotaging and sad way; and we got to see Felicity come to terms with what she had to do to Havenrock last year. I'm kind of loving the new recruits, and none more than Ragman (also known as Rory, which just makes me think of Rory Williams from Doctor Who) — a hilariously quippy little fellow who makes meta commentary a lot. But for every few good recruits, there is one lone wolf. Er, lone dog in this case. Rene Ramirez has been a little problematic for Oliver since the beginning of the recruitment process. He doesn't like authority very much, he's stubborn, and he prefers to act as a lone agent. That's great if you're a vigilante in the streets, a la Arrow season one's Oliver Queen. But it's bad when you're on a team. Because when a leader tells you not to do something, then you go around and do it and accidentally create a supervillain, that's... well, it's definitely not good. Especially not when that supervillain they create cannot feel pain. Whoops. And so Oliver understandably flips out when he realizes that a member of his team killed a man (and this is before he realizes Rene turned Derek Sampson into a supervillain), explicitly disobeying orders. But that's crucial, so re-read that last sentence. Oliver gave Rene ORDERS and he expected him to follow them, blindly. The issue with Oliver this year is that he's having to learn an entirely new way to become a leader — both in the public sphere and in the private. He can't bark orders anymore and expect people to follow them. That hasn't worked since pre-"The Climb," and it sure as heck is not going to work on someone like Rene. On the others? Sure. They're pretty complacent and eager for Oliver to like, not punch them in the face during training. But Rene is a lot more strong-willed. As Felicity points out, he might even be more stubborn than Oliver. And so when our Green Arrow looks at his team and works with his team in "A Matter of Trust," we discover that he's actually not working with them at all. He's simply telling them what to do, or not do, and then walking away. That doesn't inspire trust or confidence. Being the only voice that matters is not what leadership is all about. And it's especially not what someone like Rene really needs in a leader. Funnily enough, Rene had good advice before he went rogue, telling Oliver that his connections in neighborhoods where Oliver couldn't go would be able to get them leads on who is manufacturing Stardust — a drug more lethal than Vertigo. But does Oliver listen? No. Because if an idea doesn't come from him then it must not be worth hearing. Again, I think it's important to realize that Oliver is trying to become a leader. He was always the figurehead of this hero business, but he's never really had to actually lead people apart from walking in front of them into a fight. Real leadership — true leadership — requires humility and admission when wrong. Oliver is learning to do both this season, but it's a slow and steady process. It is Felicity's speech to Oliver that is most telling in this episode. (She's been giving him a lot of speeches lately, if you've been keeping track.) She notes that any time someone on Team Arrow 6.0 fails, Oliver fails. It's a concept that I literally just talked about with co-workers today. Our work recently did a survey throughout the organization that was focused on trust and leadership. And today, we discussed the fact that leaders bear the burden of responsibility — when things go wrong, they carry that burden; when things go right, that burden is lifted but the people they lead are the ones who can celebrate the victory (as we see at the end of the episode). Even though Oliver physically didn't kill Derek and resurrect him as an angry psychopath who can't feel pain, it's still his fault because he's still the leader. And as Felicity begins to dissect Oliver's baggage, she points out that because Oliver didn't listen to and trust Rene, he turned around and took matters into his own hands. Oliver needs to get past this whole: "Why am I even wasting my time if you don't listen to my every order?" thing he's got going on, and I think this week was a wake-up call for him to realize that if he doesn't get his act together as a leader and actually, you know, LEAD the team rather than just tell them what to do, he'll have many MANY more burdens to bear. Can't we just officially elect Thea Queen as mayor? She's doing all of the heavy lifting for Oliver anyway! Oh, right, in case you didn't catch it... Thea is doing all of the hard work while Oliver's name is on everything. In some instances, that's bad (like this week, when Thea ran her mouth to a pretending-to-be-innocent reporter), and in some it's good — but only for Oliver. Remember when I talked about how when you're a leader, you are responsible for if your team and their actions? Oliver realized that on two fronts this week, and one of those fronts was in his mayoral staff. It's revealed to the public that Quentin Lance has been named deputy mayor, but when Thea goes to the reporter to set the record straight, she accidentally confesses that SHE made the call about Quentin and Oliver didn't even know about it. I shouldn't have to tell you what comes next — the story gets out that Thea is making decisions on behalf of her brother, and everyone now knows how absent he really is as a leader. But what Oliver does at the end of the episode is give a rousing speech to the public about how anyone on his staff whom he trusts speaks for him. So that settles that! Oliver has decided that Thea can continue to run his office as if it was him actually running it. I was so glad that we finally got the ball rolling this week in discussing Felicity's guilt over Havenrock. When Curtis realizes that Rory is from the town that Felicity was forced to decimate, he confronts her — twice, actually — about confronting Rory with this information. At first, our favorite blonde hacker tries to dodge this reality but when Curtis tells her: "Keeping secrets never works out," I think Felicity finally remembers everything that happened between her and Oliver last year. Thank God for Curtis, you guys. Where was he last year when we needed him most?! I'm going to pause here before I discuss the end result of Felicity's confession to point you all to some brilliant writing by my soul sister, Jen. She sent this section about Felicity Smoak to me last night before bed, and I was struck — as always — with how profoundly she described the difference between two words. In this case, it's "responsibility" and "blame." Felicity is responsible for what happened at Havenrock, but she is not to blame. I'll just quote what Jen said, actually: Felicity didn’t launch the nukes. Damien Darhk did. Felicity is not a sociopath. Damien Darhk was. Felicity didn’t want the world to end in nuclear hellfire. Damien Darhk did. Felicity didn’t choose this war. Damien Darhk forced it upon her. HE IS TO BLAME. Damien Darhk is evil. The problem, however, is that Felicity hasn't separated "responsibility" from "fault" yet, in her mind. She equates the two things — she re-routed the missile, and therefore she is to blame for the deaths of thousands of people. That's simply not true. She was not the one who made the missile and who directed the missile. In her decision (which she had to make quickly) she saved so many lives, while unfortunately having to lose others. She is not to blame for the lives lost because she did not want them dead — Darhk did. But she blames herself all the same, replaying those moments over and over again and feeling the weight of all of their souls pressing on her. Because, as Jen noted, Felicity is the kind of person who cannot see life like Curtis did when he told her that she had to sacrifice some to save a lot more. Felicity sees each life as someone lost, and she sees herself as the reason they are gone. Not Darhk. She doesn't blame him right now. She blames herself. There's a quote that one of my favorite speakers has said, and it's this: "Feelings are real, but they are not truth." Isn't that an incredibly simple and yet profound reality? The things that we feel so deeply are very, very real; but that doesn't mean they're true. I can wake up tomorrow morning, put on a pair of jeans, look in the mirror and say: "I feel ugly." That feeling is real — I cannot invalidate its reality. But it's not true. And I know it's not true. But I listen all the same. That's what's happening right now to Felicity; she's listening to the feelings in her head that are very loud and very real but aren't true. And unfortunately, I think her own words to Oliver earlier in the episode don't help much — because the burden of leadership is that we have to accept responsibility for things, even when they're not our fault to begin with. Just like it was not Oliver's fault that Rene killed Derek, it is not Felicity's fault that Damien killed all of those people in Havenrock. But both feel that burden anyway. I was so pleased with the Diggle story this week, after the writers decided to stop trying to "one-two" punch us with revelations and timelines. First things first: Diggle and Lyla now have a son, named after John, not — sadly — a daughter named after Sara. Thanks a lot, Barry! Secondly, Diggle is now in prison and being framed for the death of that soldier and like, lots of other stuff because the traitor-soldiers used him as their pawn. Diggle thinks he was their back-up pawn, and that's probably true. Lyla doesn't care though, and she wants to take those men down. While in prison, Diggle is forced to share a cell with Deadshot (something I was so very confused about given timelines and what Barry changed, come to find out that — surprise! — Deadshot isn't actually in the cell with Diggle), and the two have a conversation. As I just stated, Deadshot isn't really there, which initially annoyed me. But then I began to wonder, "If Diggle is going to imagine anyone in a cell with him, why would it be Deadshot?" And I think the answer is this: it's because Deadshot was the one person Diggle spent so much of his time hating. He was easy to place the blame on for Andy's death, and he was an easy target. Deadshot is this manifestation of someone who Diggle thought for so long was evil and horrible, and then who turned around and — at the end of his life — sacrificed himself for Diggle, Lyla, and their family. Now here comes the whammy: Diggle has spent so much of his life feeling like a good guy and a hero and a soldier who fights for what is good and — at the end of last season — turned into a murderer, and a broken, hardened man. See the parallelism there, folks? Because it's pretty cool. Dig is so broken right now that it's almost hard to watch. He actually accepts the fact that he's in prison by the end of the episode. He tells Lyla to stop fighting because he deserves to be there. He deserves punishment, maybe not for what he's being accused of, but certainly for what he did to Andy. Even though it's incredible sad to watch Diggle fold like this into darkness, I'm hopeful that he will find a way to rescue himself and that his friends will (next week) physically come to his rescue, too. Because the truth is that we all need a team. We all need people in our lives we can trust, and we need them even more when our worlds don't make any sense. "A Matter of Trust" proved that in order to have successful leaders, you need to have trust and communication. Hopefully, everyone on Arrow this season will learn from their mistakes of last year and actually start to trust one another again. I know I would sure like that to happen! In flashback-land, blah blah blah, Bratva is brotherhood and sometimes we have to do bad things in order to get justice. We all know this tried-and-true theme in storytelling. Next, please! Cody Rhodes did a fantastic job of bringing to life a creepy drug kingpin named Derek Sampson. The fight scenes were pretty fantastic. And bonus points: apparently Cody and his wife used to go to my church! Who knew! So Felicity's new boyfriend met Green Arrow this week. Obviously the latter doesn't know he is Felicity's boyfriend or else dude would have had an arrow in each leg. I can't decide what to call Evelyn's character, so I'm sticking with Baby Canary for now. Also, does anyone else think she looks a lot like Bailee Madison? "Are you SURE you were an Olympian?" We got a reference to Mr. Terrific in this episode! Arrow has used slo-mo in its action sequences about three or four times now. That is about two or three times more than necessary. It's getting cheesy, you guys. Save the budget for next year's Oliver/Felicity wedding, okay? Evelyn asked the question that we waited FIVE YEARS TO KNOW THE ANSWER TO: do the people who build the lair and elevator know Oliver's secret identity? Oliver seemed hilariously baffled by that question and did not know the answer. Thea threatened Reporter McRudeFace (that's her name, and if you remember her actual name, I have just this to say...) and it was SO GLORIOUS. I'm pretty sure if the team breaks Diggle out of prison next week, it'll be an entirely different show. Thank you, thank you, thank you for not saying Felicity has PTSD from Havenrock, 'cause she doesn't. She has extreme guilt, more like survivor's guilt, but not PTSD. She should have PTSD from... when The Dodger tried to blow her head off, in "Savior" when she saw someone die for the 1st time, the Undertaking, when The Count tried to OD her, (the big 3) When Slade had a frickin' katana to her throat, being a Jewish girl and getting throw in a gas chamber to be killed BY GAS IN A GAS CHAMBER (good call writers, geesh) during hanukkah, and finally, being shot multiple times, resulting in becoming a paraplegic, right after the gas chamber. I'm done now :). Oh, and excellent review, as always.